If I was better at naming pets, then my poor hamster would have known he was a dude. When I was about 9 or 10 I fulfilled my dream of having my very own pet. I was the proud owner of a hamster! This hamster was so special and wonderful and great. And I named her Daisy. 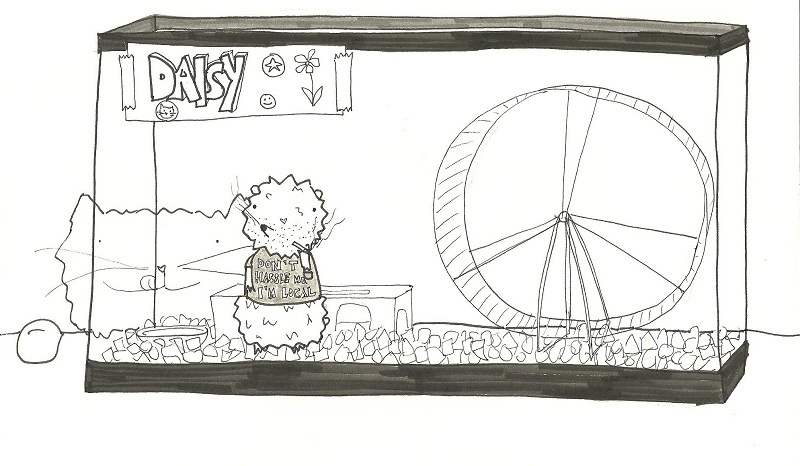 Daisy was really cool when she was running on her squeaky wheel all night long. Oh, and when she ran in her ball around the house it was awesome when she peed in it every time. She was also cool when I realized that she was a boy. Her his um….ahem…boy bits gave it away. Poor Daisy was stuck with a lady name as a boy. To honor his masculinity, I drew him as a tough guy wearing the shirt from What About Bob? since that movie is hilarious. If you’ve ever lived in an old house, you might know what I’m talking about…but for your sake I wish you didn’t. I have a turtle that I named Rocket and decided was a boy-turtle. In my world all turtles are boys because there’s nothing feminine about them. In college I made friends with someone who knows way to much about animals and informed me that Rocket is a girl evidenced by the shape of “her” shell. But Rocket will forever be a boy to me. When I was a kid, one Easter my brother and I each got a hamster. They were both boys—or so we were told. We found out that not only was one a girl, hamsters multilpy fast. And often. And if you don’t separate daddy from mommy and babies daddy eats babies and when he does that mommy gets mad and kills daddy. Daisy looks very manly indeed!